A couple of our servers, and even more laptops, are coming with no optical drives installed. This can be a problem when it comes to installing an operating system. I use the excellent Windows Deployment Services role on Windows Server (2000-20012 R2) to accomplish this. It works very well in deploying Windows Server and Windows 7 over the network via a pre-execution environment (PXE) and can even deploy Windows XP images if the need arises (see my “how to” article here). The one limitation it has is that you cannot install Linux distros. This is a problem because you are only allowed one PXE server on the local area network (LAN), so you would have to choose either a Linux PXE server or a Windows one. PXELinux can be set up to preceed the usual WDS boot menu you get after hitting the F12 key. It launches it’s own menu that will allow you to boot to your existing WDS set up, the local hard disk or any Linux tool/distro you desire. If you have used tools like The Ultimate Boot CD, Live Linux CD (e.g. Knoppix) s or Anti-Virus boot CDs it can be an exciting thought to get these all running from your WDS server. 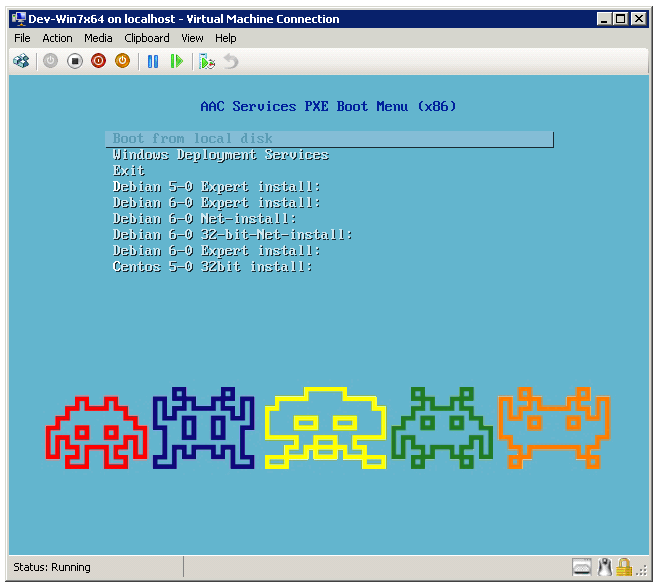 PXE and Kickstart, Automated Installations for Linux via WDS at Ohjeah! Previous PostEasily Create your own Custom Web App in Chrome for Twitter or AnythingNext PostWhat is the Post-PC era and are we there yet? Man, thank you so much. You are the only site online where I’ve been able to find this info. I can’t believe I’m the only person commenting, either! Thanks for the information, the instruction links you provided were perfect. This was quick and painless to set up! Hi I’m doing a project for Erasmus and I very much agree Sean, is very hard to find some info on this subject. But could I also implement this solution when the client pc have to be able to dual boot, Windows 7 and Ubuntu? Not 100% what you mean but I think it is possible. Do you want to give users a start-up menu to choose to boot into Ubuntu or Windows or do you just need it to co-exist with an existing dual boot PC. Yes first case, i want to give the user a start-up menu to choose between the two. And i need to use WDS, and install existing image of ubuntu and windows 7 on the clients. I’m still a little bit new to this subject, so sorry for my unknowing. You can then use Clonezilla (from the PXE boot menu) to capture the disk image and clone on to other PCs. Clonezilla will keep the correct boot record. Then, for a normal boot, just let the PXE menu timeout and it will continue on to the normal hard disk boot, which should then give you the OS Chooser. This is all from the top of my head so you will need to test it out. Thank you very much, I wil try this a soon as possible. i am using WDS and PXELinux for windows and Linux OS installation. i am able to start the OS installation. i would like to know, can i track the progress of OS installation? means how can i get the status whether OS installation was successfully happen or not. It’s not a native part of WDS to have any kind of monitoring. If you are using multicast, you should be able to see the progress of that from the WDS Server console. You could implement Microsoft’s free MDT solution on top of WDS. This has monitioring built in to it. What should I do when I see the customised PXELinux boot menu but no option is working? I can’t boot from local disk and also ‘Windows Deployment Services’ menu option is not working. When I boot without PXE the system is loading properly. My PXE is unable to locate the cfg file. It reads pxelinux.com from my server but I’m unsure where the break is. I Followed everything to the T.
This guide looks great but does it still work for windows server 2012 R2? Many thanks for posting this guide. This works perfectly for the servers that I’m implementing when these are placed in BIOS (legacy) mode, but I was hoping to have UEFI enabled. Have you had any luck in configuring this for UEFI? what is the modification needs to be done to UEFI based install?